Hurricane protection products for residential and commercial installation applications in the Greater Carrollwood FL area. Home Safety Solutions offers a full line of hurricane protection products including Shutters, Panels and Wind Screens for Greater Carrollwood FL area Residential home owners and Commercial property owners. Our products meet Miami-Dade County and Florida Building Code requirements. We are Greater Carrollwood’s #1 choice for protecting homes and businesses against the forces of nature – violent weather, storms and hurricanes for over 30 years!! Greater Carrollwood FL Rolling Shutters provide protection against hurricane force winds, flying debris, vandalism and unwanted entry. Greater Carrollwood FL Accordion Shutters provide substantial protection against hurricane force winds, flying debris, theft and forced entry. Greater Carrollwood FL Metal Hurricane Panels Now there’s no need to worry about damage caused by “flying objects” during a hurricane or tropical storm. Greater Carrollwood FL Clear Hurricane Panels Clear (Lexan) hurricane panels offer high performance, optically clear window and door protection. Greater Carrollwood FL Colonial Shutters Decorative and protective, the Colonial Shutter provides aesthetics and added protection from gusty winds and rain. Greater Carrollwood FL Bahama Shutters Whatever the architectural style, the Bahama Shutter is sure to compliment it… home, office, condominium or storefront. Greater Carrollwood FL EZ-Screens Protects structural openings with materials that will resist ultra violet rays and can with stand hurricane force winds. Greater Carrollwood FL Fabric Hurricane Panels Designed to cover windows, doors, and other home openings and protect against the destructive forces of hurricanes. 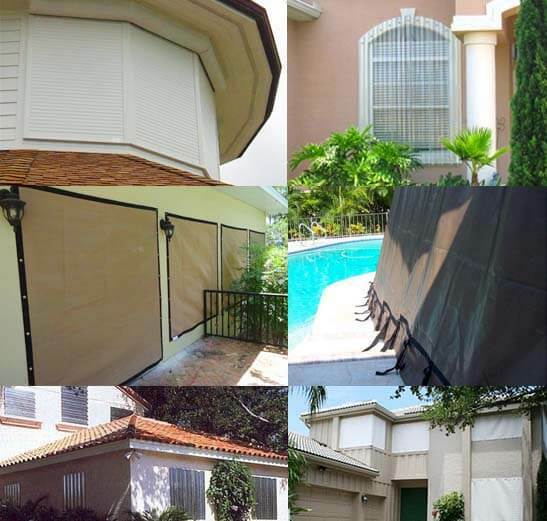 Greater Carrollwood FL Force 12 Wind Screens help protect from heavy winds and flying debris, two causes of damage and destruction during hurricanes.